After going months without a homicide, the city of Santa Maria has now had two murders in the last two weeks. The latest victim was a 19-year-old man, who was shot and killed early Sunday morning. 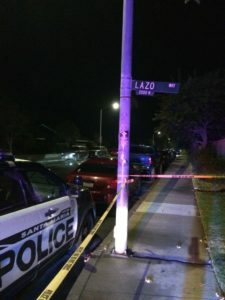 The shooting occurred around 12:40 a.m. in the 2000 block of North Lazo Way, according to the Santa Maria Police Department. The suspect or suspects remain on the loose. Police have identified the victim as Santa Maria resident Edward Jonathan Ramirez. Officers found Ramirez after he was shot near the roadway. Responders tried to resuscitate him but did not succeed. Authorities have not released any information about a possible suspect or suspects. An investigation into the homicide is ongoing. Following 2015, in which there were 13 murders in Santa Maria, and 2016, in which there were at least nine, no homicide took place in the city this year until late last month. On Aug. 24, a Santa Maria man shot and killed his estranged wife and fled with their 9-year-old son amid a contentious divorce and custody battle. Officers later shot and killed the murder suspect in Los Angeles and rescued the child. Anyone who has information about Sunday’s murder is asked to call the Santa Maria police watch commander at (805) 928-3781 ext. 2297. Boycott Santa Maria, it is a dangerous and violent sanctuary city, and the word on the streets is that this was a MS-13 ‘hit’. The FBI announced that, per capita, Santa Maria is one of the ‘Most Dangerous’ California Cities, and I recommend that you not bring your family to the downtown area to shop or spend time. The Santa Maria City Council has made Santa Maria a ‘de facto’ sanctuary city, and Santa Maria Mayor Alice Patino refused to support ICE’s mission to secure our community. Shortly after, a 8 time convicted illegal alien, Victor Ramirez, raped, mutilated and killed Mrs. Marilyn Pharis, a US military veteran. Maybe the deportations, or the fear thereof, are making a difference. Do I want to vacation in Cabo San Lucas or Santa Maria….both have a chance of getting shot, but at least Cabo has a Beach! Seriously Rich? Yet another young life has fallen to the seemingly abated violence that has become so pervasive in the American culture. When will it stop? Where does it end? Don’t think for one minute that sort of violence will only affect the minority populations of the country….it’s right on your door step…best not turn a blind eye to it.